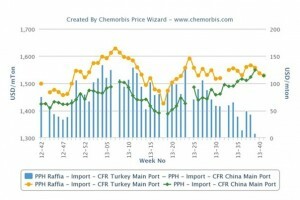 According to ChemOrbis Import Statistics, Turkey imported almost 122,000 tons of homo PP in August, showing an increase of less than 1% month over month. Saudi Arabia was the top supplier to Turkey with 46,019 tons, followed by Egypt and Iran with 12,000 tons and 10,904 tons, respectively. Saudi Arabia is historically the largest homo PP supplier of Turkey, overtaking its competitors considerably as it owns almost 50% of the market share. However, Egypt and Iran are beginning to corner the Turkish market since they respectively became the second and third largest supplier of homo PP in August. Homo PP imports from Egypt almost tripled in August when compared to the same month of last year while homo PP imports from Iran hit a record high on a monthly basis for two months in a row. Indeed, homo PP imports from Iran for the first 8 months reached a cumulative amount of 39,000 tons, which already passed the total imports made from this country during all of 2012 at 29,000 tons. In 2012, Turkey’s top 5 suppliers of homo PP were listed as Saudi Arabia, India, Greece, Egypt and Israel. When it comes to this year, the data revealed by TurkStat for the first 8 months reveal that Saudi Arabia continues to be the major homo PP supplier to Turkey with 342,000 tons of cumulative imports from that country, forming almost 40% of the overall market, although they are down by 5-6% when compared to the same period of last year. Saudi Arabia is followed by Egypt as the second largest homo PP supplier with 66,000 tons of imports in the first 8 months of 2013. Moving from the fourth place to the second, Egypt raised its market share by 20% when compared to the same period of last year. The third place continues to be formed by Greece while India has moved down to fourth place in the first 8 months of 2013 from second place in 2012. The fifth place is formed by Israel with 40,000 tons of homo PP imports, although Iran is close enough to threaten its place in the list of top 5 suppliers with more than 39,000 tons of imports, according to ChemOrbis Import Statistics. As nearby sources, homo PP imports from Egypt and Iran have showed a remarkable increase so far in 2013. Their rising market share has also started to influence the pricing of the homo PP market noticeably. To some players, the competitive prices of these cargoes are playing a role in the lost premium of Turkey over China. 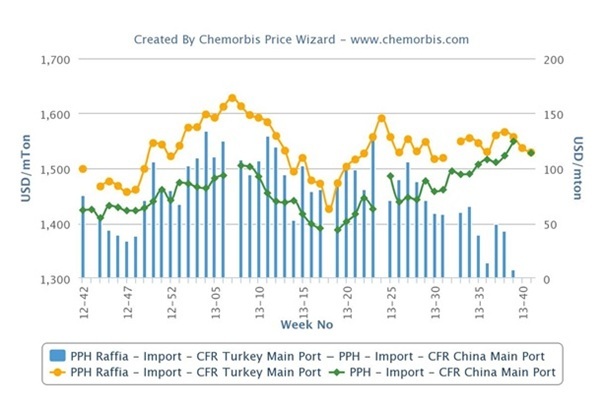 Under balanced market conditions, Turkey should be trading with a minimum premium of $60/ton above China due to its relatively smaller market share and higher freight costs. However, Turkey has been seeing import homo PP prices almost equal to China recently, players say. “Attractively priced Iranian and Egyptian cargoes provided us an upper hand in our negotiations with the Middle Eastern suppliers during August and September,” commented several PP converters in South Turkey, where many buyers are covered for at least one and a half month.